Our roto-moulded process – our preferred method at Excelsior – allows us to manufacture a huge range of products for any number of industries. But why is plastic the best material to use for these products? We’ve talked before about the advantages that plastic could offer your company’s products, but today we’re taking a moment to tell you how it specifically benefits ours. Roto-moulded plastic offers a variety of benefits to food bins and other such containers, but chief among them is its sterility. Plastic makes a poor home for germs and bacteria, which means that it doesn’t contaminate the goods inside the containers, and makes an effective shield against microscopic threats. Meanwhile, its lightweight construction makes the containers easy to transport, and its considerable sturdiness means that they can take a bit of knocking about without spilling or damaging their contents. Our roto-moulded safety steps are made from 100% medium density polyethylene, meaning they’re highly resistant to chemicals or other substances, and like other plastic products they’re extremely durable. These two main qualities alone make them suitable for a range of settings and environments – from warehouses and builders’ merchants to classrooms and offices. They’re also light, which means that they don’t require any special techniques or training to pick up and move around, and anyone can use them to reach various shelves or high places with very little effort. If they’re dropped, their weight ensures that they won’t do any serious damage, and in a similar way they’re not heavy or dangerous obstacles if someone accidentally kicks one. We’ve talked before about the use of bright colours in design, and the bright colours of safety steps often help keep them visible in frantic environments, reducing their potential as a tripping hazard. (Preferably avoided in any classroom or office situation, this has far more serious consequences in an office environment, as a trip or fall in a warehouse or workshop has even greater increased risk for severe injury. 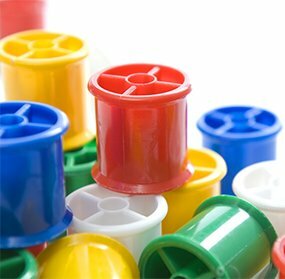 This isn’t a totally comprehensive list of all the advantages that rotational moulding plastic offers our product range, but should give you a good insight into some of the key benefits it offers, and why our products function as well as they do. You can also read about how the construction industry gains from the use of plastic, or get right to browsing our product range.